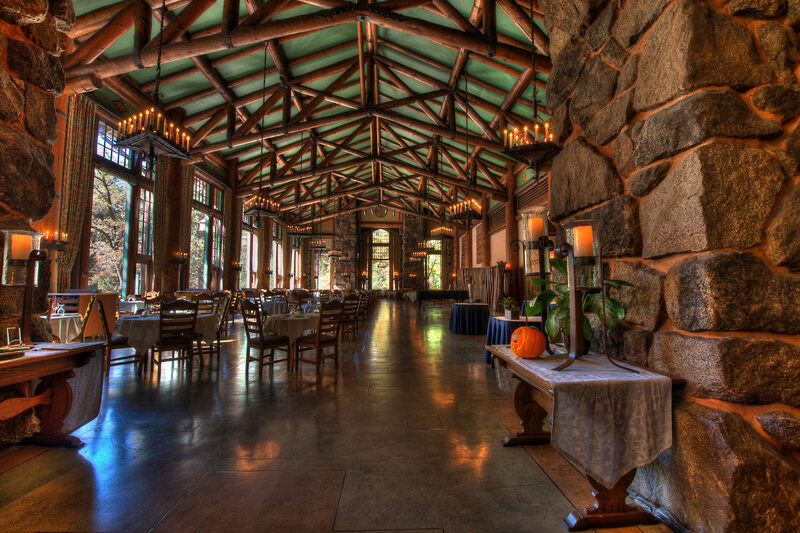 Why HDR – HDR is the mixture of art and science resulting in a photograph with a High Dynamic Range of light and color -thus the name HDR. 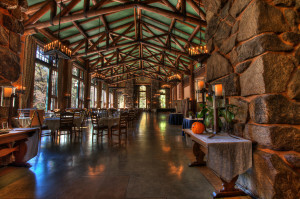 The shot below of the dining room at the Yosemite Awahnee Lodge illustrates this. Click on the photo to see it large and you will see that the very bright outdoor light in the windows is clear and not “blown out white” and the indoor detail is also exposed well. In a single image this would be impossible! Unfortunatly few of us asks ourselves what draws us to pick up the camera and take a picture. As a result we often get pictures that are uninspired and not at all what we remembered. This moment before clicking away is an important moment in the creation of a great image and a larger subject than HDR. In the future, I may go into this, but now I will limit myslf to HDR. Often the sceen has a very broad range of color and light levels. As you look accros the vista your eye adjusts to the light levels and you see a wonderful photo. Unfortunatly your camera only sees a small part of what the eye sees. The resulting picture falls short of your memory. To capture a picture to match your memory reuires a very wide range of light and color- or HDR. My goal is to get you the think about the final image before you take it. If it “fits” into HDR, then follow the instructions below and capture the light. Once you walk away it is gone. Here are some things that would push you into shooting HDR. Shadowless hazy days or overcast skys can result in dull looking photos. HDR can turn them into great images. Photos taken directly into the sun (or bright sky) may have a nice sky but everything elso can be a black silhouette or blob. This is fine if it is what you want, but it is not what you see with your eyes. Many times there are “things” like a foreground that you really want to be in the photo. But the limitations of the camera prevent this. Either a nice sky and black everything else or everything else well exposed and the sky white with no details. This is a HDR moment. Another example is taking indoor shots. The room is darkish but has a window with outdoor light. The exposure for the room results in the outdoors becoming overexposed white with little detail. Another HDR moment! Well for me, it’s the grandkids chaseing the dog, HDR is out (other than one shot HDR). HDR is not spontanious, but planned and deliberate. For everything else, well I go for HDR. If I shoot HDR I have the option of picking the best exposure and going with single shot. If I don’t, there is no option. You do not need a $50K Hasselblad to take HDR. In fact if you have a $50K Hasselblad you may not need HDR (as much). Any camera from the more advance Point and Shoots can be used. All the camera need to be able to do is adjust the exposure. The science of HDR starts by taking several pictures varying the exposure. It is best to use a tripod and keep the aperature the same. The “underexposed” shots will have great detail in the bright parts of the image while the “overexposed” shots will have great detail in the dark areas of the iimage. Putting them togather you have the best of both, a HDR image. Here the tutorial gets difficult as each camera has a different way to get this done. My Nikon has a “Bracket” function that automatically takes a series of photos. Many other have a similar function. Let me be clear, I use my camera because it is the best camera in my hands. Others use Canon, Olympus, Sony, etc for the same reason. The best photograph is taken by the best photographer, not the best camera! I like to bracket +1, +2, +3 and 0, -1, -2, -3 stops. Much of HDR is done with +2, 0, and -2 stops. I will talk about single shot HDR later. I use a couple different workflows for post processing HDR images. The more complicated one is patterned after Tray Ratcliff’s method and is described in detail on the HDR Workflow Page. The second method is somewhat simpler to use. I simply take the HDR series in Lightroom and export to NIKs HDR Pro (by Google). I then frequently do pass the image through different NIK modules to get the finished image.